Them smart folks at Hodderscape got so antsy waitin’ for NUNSLINGER release day on the 26th, they started formin’ themselves a gang of writerly outlaws and varmints to storm the e-book stores and plunder themselves some yarns to keep ’em warm through Boxing Day. They seem to be inferrin’ that my name is a mite like some jest of big pointy chairs an’ the old London Underground steam wagons. Can’t think why… Just ‘cos of my buddy Targaryen Stratford, maybe. Anyhoo, get your own name here and y’all be eligible to join the gang. That’s presumin’ you’ve already done pre ordered Book 1 for free, as well as Books 2 & 3. 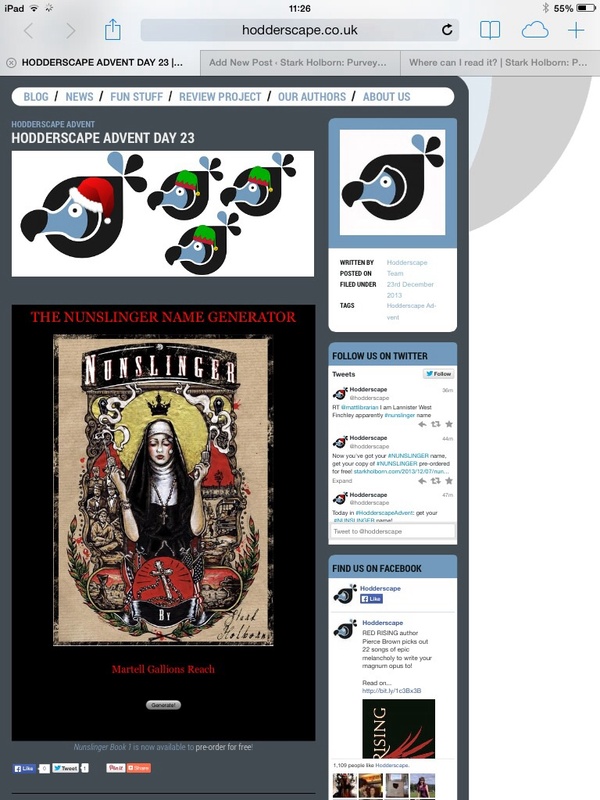 Posted in Nunslinger.Tagged Hodderscape, Name Generator, Nunslinger.